Hot flashes are possibly the most common and well-known symptom associated with menopause. How long these symptoms last depends on a variety of factors and the time frame is different for individual women. While some will experience them for the entirety of their menopausal period, others will only have them towards the end of this time. Women starting the menopause earlier are more likely to experience the symptoms for a more prolonged period of time. As these experiences are completely individual it is not possible to give precise answers. 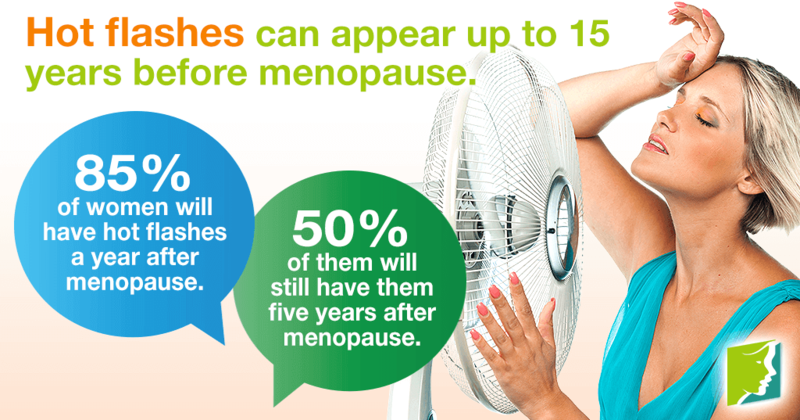 However, there are some averages that can help give women an idea of how long is it normal for hot flashes to last. They are often thought to start about a year before a woman begins menopause, and according to The British Menopause Society, hot flashes affect a woman for an average of ten years. Hot flashes can greatly disrupt a woman's daily life. Fortunately, there are a number of ways to reduce their intensity or duration. Women who are concerned about hot flashes have a number of treatment options available divided into the following categories: alternative medicines and prescription medications. Soy supplements. Several studies show that women who take soy supplements or consume large amounts of soy regularly are less likely to experience hot flash episodes. Black cohosh. This is a well-known phytoestrogenic herbal remedy, which literally tops up the body's hormone levels. It is the most widely used supplement against hot flashes in the U.S.
Sage tea. Although sage does not address any hormonal issues directly, it has been shown to cool down the body, preventing hot flashes and excessive sweating. Collectively known as hormone replacement therapy or HRT, prescription medications against hot flashes or other menopause symptoms involve different combinations and presentations of external estrogen and progesterone. They can involve pills, creams, gels, patches, or implants, but their use requires constant monitoring by a physician. Hot flashes are generally not a cause for medical concern as they are a common and expected symptom associated with the “change of life”. However, if they become too intense or are causing excessive discomfort or stress then it is best to seek medical advice. Women can also explore these links and then discuss their findings with a trusted doctor in order to learn more about hot flash treatments. Gain control of your body temperature and stress levels via these effective methods for relief. You will feel cooler and have more peace of mind. When your hot flashes are intense and frequent, they may impact your well-being. It's important to understand the myths and facts about this symptom. Read all about hot flashes after menopause in women over 60, including what causes hot flashes long after menopause and how to manage them.